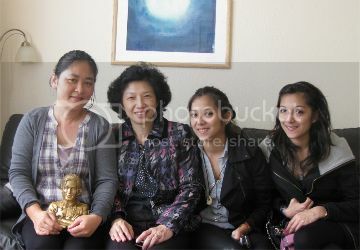 I finally met in person with Jocy Ma and her lovely twin daughters Prety and Morly last September in London. They are the Ma family that had a long term friendship with Michael. 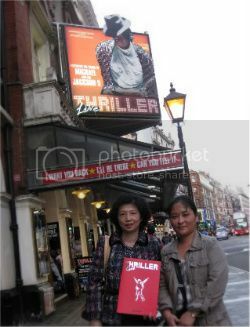 Surreal as it may seem, one day, because of my blog I was to meet the Ma family that knew Michael so well. It was a magical day, a rare opportunity to meet them all and a real treat to hear about Michael in their own words. With Jocy's blessing I thought I should share it with you. I never thought I would featured in my own blog! Last Summer Jocy contacted me after she came across my blog covering their story with Michael. She was appreciative that I had translated their story, she also expressed her wish to use my blog content on her FB sites, and wanted to meet up in London where I live, as they were soon to visit the city. Later I learnt that the twins were pursuing their education in this country. Just a couple of days before Jocy was due to fly back from London, she called me. They had been sightseeing around London and happened to be staying not far from me. Despite the short notice, I invited them round my house, and I later joined them to see "Thriller Live" show in the West End! 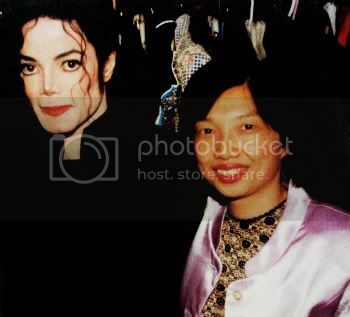 She recalled a happier time when Michael was last on tour (History World Tour), they were very fortunate to be invited to follow him for at least 30 concerts around the world, and were very privileged to see him perform as VIP guests. She remembered a funny moment of how her 4 year old twins asked the King of Pop: "Can you dancing?" A very surprised Michael responded that it was the first time in his life that anyone asked him that question... (below video at 2.05) This sweet and innocent quote later even became the twins' security password! Michael can be heard asking the twins the same question on stage during Heal the World song live in Durban, South Africa, the final stop his last tour. Michael even took a moment to have a picture taken with the twins on stage. The twins had many great memories, they recalled the shooting of the Esonic DiscBaby commercial in 1997, and spending Christmas at the Neverland ranch in 1999. 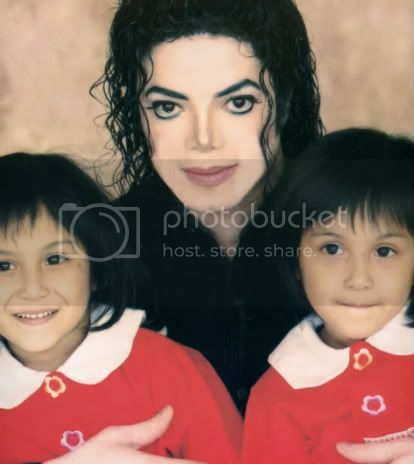 The lucky twins certainly had Michael Jackson as part of their childhood magical memories! Jocy revealed that they were also invited to attend the 30th anniversary concert in New York in 2001, and Michael was planning to take them up to visit the Twin Towers. But in the end they had to cancel the trip to the U.S due to some private matter back home. They later watched in horror of the terrible 9/11 event unfolding on TV! Similarly, according to Michael's brother Jermaine that Michael was supposed to be at the World Trade Centre for a meeting that morning, luckily he slept in. After, the family visits to the U.S became less and less frequent because the twins had started to attend school. They still remained in contact with occasional visit to the Neverland. Michael was a very good father to his three children who Jocy had met. Michael was a kind, amiable person who was also very spiritual and often spoke about God. (She is also a devoted Christian) Despite the occasional language barrier they were able to connect, Michael once said that Jocy reminded him of his mother Katherine who he adored. After Michael passed away, she still often has dreams about him, sometimes even feels his presence.... she firmly believes that he's in a better place. Jocy remembered one of her last conversations with Michael was how much he would love to visit the Great Wall of China with his kids in the future, and he wanted Jocy to join them as tour guide. This sadly become another of Michael's unfulfilled wishes. When it came to the end of our time together, I suggested that she visit the Michael Jackson's wax figure in Madam Tussauds while in London. "Why would I want to see his wax figure when I've seen the real Michael Jackson!" replied Jocy, then it occurred to me that Michael was real to them and a friend who had left them lots of amazing memories to cherish forever. 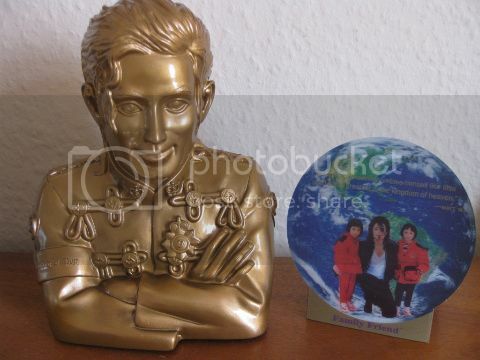 Thanks again Jocy for sharing your memories of Michael, and your kind gift of the MJ money bank, which is currently resumed production with a new model in gold, to continue his love and legacy by encouraging people to save money to help the disadvantaged children. Below video is the highlight version, featuring Michael Jackson with twins during History tour in Taiwan and South Africa.